What to feed your 1-2 year old baby? 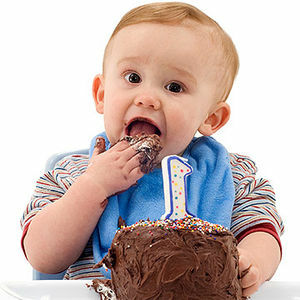 At this age toddlers are moving from the eating habits they had as infants toward a dietary regime more like your own. Your task is to keep introducing new textures and flavors. Preferences for food are set early in life, so assist your child develop a taste for healthy foods now. Children have small tummies, so serve foods that are full of nutrients they need to grow strong and healthy, and restrict the sweets and worthless calories. Your baby will continue to consider self-feeding, let him start with fingers and then with spoons at around fifteen to eighteen months of age. Give your child many options to practice these skills, but lend a hand when the little one is vexed or irritated. As skills develop, give the little one space and let your baby take over. Toddlers also like to claim and maintain their freedom, and the table is one place where you must give the little one some sense of control. Allow your toddler to react to internal indications for hunger and fullness but set the boundaries. Remember: You decide what range of healthy foods to provide at a meal and your child determines which of those foods to eat, how much to eat, and whether to eat at all. Milk is a vital part of a toddler&apos;s diet because it provides vitamin D and calcium, which help establish strong bones. Most toddlers under age two should drink whole milk for the dietary fats required for brain development and normal growth. If a toddler is at likelihood for becoming obese or there is a family history of high cholesterol, obesity or heart disorders, doctors suggest shifting to reduced fat (two percent) milk. Discuss with your doctor before doing so. Apart from good intake of milk the child should have good exposure of sunlight so that he can get adequate amount of vitamin D.
When your child is two, you can make the change to nonfat or low-fat milk. Between twelve and eighteen months of age is a good time for shifting to a cup. Instead of cutting out bottles all at a time, you can slowly discard them from the feeding itinerary, starting with mealtime. After the child has begun the meal, offer whole milk in a cup. If you are breastfeeding, only give milk in a cup and evade the habit of bottle habit completely. Bottle feeding as a habit should be totally discouraged. Some toddlers don&apos;t like cow’s milk initially because it&apos;s different from the formula or breast milk they are used to. If that&apos;s the case, it&apos;s fine to give the baby a combination of whole milk and formula or breast milk and slowly change over to hundred percent cow&apos;s milk. It&apos;s crucial to watch out for iron deficiency after toddlers reaches one year of age. It can influence their mental, physical and behavioral growth, and also can lead to anemia. Restrict your child&apos;s milk intake to sixteen-twenty four full ounces (approx. 500 ml a day). Remember all types of milk are a poor source of iron. Elevate iron-rich foods in your child&apos;s diet, like poultry, fish, meat, green leafy vegetables and fruits like apple rich in iron. You can give the little one iron-fortified cereal until your child is eighteen to twenty four months old. Discuss with your doctor if you&apos;re worried that your child drinks a lot of cow&apos;s milk or not getting adequate iron, or if you&apos;re considering giving your child a vitamin supplement. By now your child should be eating a range of foods. Continue to look for allergic reactions when initiating new foods. Be aware that a child is at higher peril of developing food allergies if the child or one or more close family members have allergies or allergy-related disorders, like eczema, food allergies or asthma. Discuss with the doctor if you have any distress. Give your child 3 meals and 2 or 3 healthy snacks a day; remember that it&apos;s common for toddlers to skip meals. Permitting kids to omit a meal is a difficult idea for most parents, but kids should be left to respond to their own internal signals for hunger and fullness. Don’t thrust foods on a child, who&apos;s not hungry, moreover kids shouldn&apos;t be allowed to eat on request all day long either. Force feeding should be totally avoided and should respect the likes and dislikes of the child. Maintain a regular timetable of meals and snacks so your toddler will come to anticipate that food will be available at specific times of the day. If you have any doubts about how much your child should eat, discuss with your doctor.